Holy crap! $63K and 13 mpg?? Back in February I got rid of my '99 Land Cruiser because it sucked gas--at 14-16 mpg on the highway. I traded it for a4runner, which has the same motor but tows 800lbs more and gets 5 mpg more.But what is Toyota thinking? The '08 LC gets 13/18 and starts at $63,200. Gas is what now...close to $3.00 and will probably be close to $4.00 by summer?WTF?? Who buys these things..and why? Re: Holy crap! $63K and 13 mpg?? Not much different than the new F-350 Ford diesels in economy, but a much much better vehicle all around. I would much rather suffer the depreciation on a new Land Cruiser, than say a new suburban, the Land Cruiser will at least hold some value. I've spent my fair share of money on fuel, and I never gave it any thought until the last year. I believe where the price of fuel is heading will be enough to get any man's attention, no matter how much money he's worth. $150 fill up on an SUV is in the near future. $150 still buys alot of beer and bait. Many are asking that same question. Have you seen a chart of GM side by side with TM for the last year? I think the reversal coincided with the incessant media coverage bashing GM and praising how great Toyota is. I have had several Toyotas (I have had several of probably every car maker) and have always thought them to be mediocre, with medicocre mileage. I really believe Honda and GM make the best cars today. Honda always has been up there. As an aside, one year ago we bougt a BMW 2007 X5 (new model year). The car looks sharp and drives vine when it is not in the dealership. It has been a nighmare. That electronic transmission computer module has failed twice. The electronic parking brake module has also failed. The car has more gremlins than any we have ever owned. And it is by far the most expensive we have ever owned. It is being traded in this week for a Saturn Outlook or GMC Acadia. Good for you, Sal. I have driven Hondas for years and most of them go for more than 200K miles; I have a GMC van with 160K miles without any major problems. My wife's Volvo spends a little too much time in the dealers shop at $149 per hour, but it's her car and her problem. The image of the perfectly-dressed car saleman with the phony smile selling expensive imports leaves me cold (being a NJ resident, I know you've seen the tv ads for Contemporary Motors - are those guys creepy or what?). Cars are like life: keep it simple. Yah it's pretty sad indeed, to think that vehicles where getting better mileage back in the 60's and very early 70's. For about 40 yrs now all the manufactures have done is skate around the fuel mileage thing, improving (in theory) everything else but mileage. I've always said the oil companies are far to big to allow oil prices to drop..........and why would the government want prices to drop when all they do is sit back and collect a percentage. My next vehicle will be a Prius. I'm not a sierra-clubbin-greanpeacer or anything, but I do respect the environment and economics. A year ago, oil was $58 a barrel. Now, it is running about $96 a barrel. There are plenty of other vehicles that will tow and get that sort of mileage for no more than half the price of one of those land cruisers. But there are still plenty of folks willing to shell out the extra 30K for a more luxurious ride and the ability to let the next door neighbors know that you are so successful that you don't care about a stinkin extra 30 large. ConchCruzer - 11/4/2007 10:38 AM My next vehicle will be a Prius. I'm not a sierra-clubbin-greanpeacer or anything, but I do respect the environment and economics. A year ago, oil was $58 a barrel. Now, it is running about $96 a barrel. I'd save some cash and get a Corolla or Civic 4 door. The amount of gas you save with the Prius you won't be able to tell; and you'd save some money up front. Get a car with a 5-speed manual and learn how to drive smart. Jackrabbit starts and hard braking cost gas. The time difference in the 88 miles I drive down the turnpike between doing 60 and 70 is about 15 minutes. If I'm in THAT much of a hurry, I can leave home 15 minutes earlier. I've said it before -- my 145,000-miles-old 2000 Passat turbo 4 (with the admiral driving) gets 38 - 39 mpg on the highway and plenty of pep when I need it. I wish local municipalities would permit golf cart type vehicles on local roads. I'd use one in town to go the the post office, go shopping, and visit neighbors. I would have used one before I retired to drive the 2.5 miles to the train station. Gee, they could even have gotten room for more parking spaces. Some gated retirement communities permit golf cart use on their roads. It's time to expand their use. FWIW, the Land Cruiser will cost an extra $800 a year in gas over a Honda CRV 4x4. So were talking an extra $67 a month on a vehicle that will cost you at least a grand a month to own. I doubt the guy that buys a Land Cruiser will care. Just to be a part of the solution I'll park my Land Cruiser and take my bike over to my buddies house to watch the Pats get their first loss. RE: Holy crap! $63K and 13 mpg. ?? If it was about pure economics, I'd agree with some and get a civic or corolla type car. However, after becoming more familiar with Toyota's Synergy Drive, I prefer the prius. After experiencing the Toyota hybrid experience, sitting in traffic with the engine idling seems like a waste. It may not add much or save enough to justify the numbers, but based on the premise that we vote every time we open our wallets, I'd like to vote in support of efficient, low emissions hybrid technology. I drive my current vehicle, a 1999 Jeep Wrangler, for economy. It is a 4 cylinder/5-speed setup that I am able to get about 22 mpg out of in a 70/30 mix of city/highway driving. By comparison, my wife is averaging about 26 mpg in her Saturn L200 4 cylinder sedan with automatic transmission in the same mix of driving. Considering that the Jeep is as aerodynamic as a brick, a truck based frame, and 4 wheel drive, that's not too bad. If the new Wrangler was in the 30 mpg range, that's what I'd want for my second vehicle to go with the Prius. I'll park my Land Cruiser and take my bike over to my buddies house to watch the Pats get their first loss. Well I gotta tell ya...I'm 74 years old and after having spent many years working 12 hours a day, seven days a week, I'm gonna spend my retirement going first class to the degree I can, which means, among other things, driving what I consider the best all round vehicle for dependability, good looks, comfort, boat towing ability and a multitude of other advantages to me and mine. Feel guilty? Maybe a little, but not enough to change my choice of vehicles. 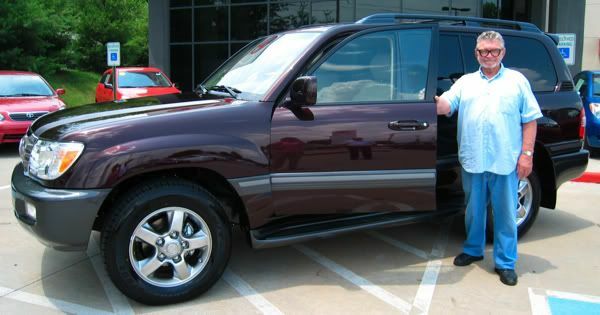 I have always liked the look and ride of Land Cruisers. Ray, yours looks great. Maybe they will come up with an advanced hybrid Land Cruiser one of these years. Has anyone found a good electric car? I drive 4 miles to work and have been looking for an electric vehicle or something similar just to get me to and from work. I thought a golf cart might work but it is not legal on 2 of the 4 miles. Any ideas? I would buy an electric car in a hot little moment. GM, Ford and Toyota (and maybe others) pulled all the electric vehicles off the road and destroyed them, musta been a threat to thier money making operations as they saw it. When they come back (and they will) you will see me standing in line for one. Hey what happened to Chevy's Hybrid Truck? Didn't they have a 1500 version? 2swift - 11/5/2007 10:51 PM Hey what happened to Chevy's Hybrid Truck? Didn't they have a 1500 version? I don't think it got any better mpg than the regular truck. I couldn't find it on the Chevy web site for 2007. Same here what the heck? There is a 05 review that said it got 15.3 mpg but that was an 05 review still looking here. Hell 3 more miles per gal is at least a start why pull it? What do the Know? I thought a golf cart might work but it is not legal on 2 of the 4 miles. Any ideas? You might want to check those laws again. Where I live, you can use the golf cart within 2 miles of where you work or live. If you drive 2 miles from your house, you are only two miles from your work, therefore still legal even though it's a 4 mile trip. If I didn't have a fairly busy road that I have to drive 1.5 miles on, I'd probably do a golf cart myself. I checked a few months ago and because 2 miles are on a road that is a posted 45mph highway, I can't use a golf cart. The other 2 miles are on a 30mph posted road and that is acceptable for a golf cart. I was hoping I could by a GEM vehicle (http://www.gemcar.com/) but they are not legal either. I just can't believe we do not have any electric vehicles that are designed for short trips and readily available. Maybe with $100 oil a few will be developed. I have found a few on the internet but I don't have any information on them yet and they do not appear to be too many of them around. I like driving my 14mpg truck but I would like to go to and from work in an elec. vehicle.